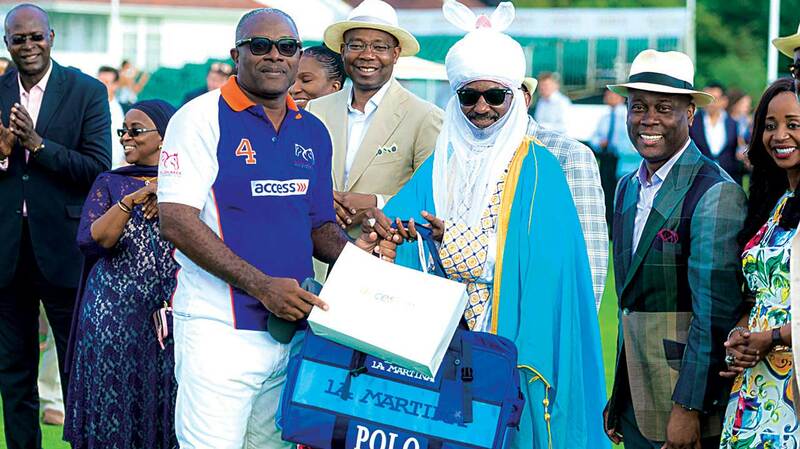 Emir of Kano, HRH Sanusi Lamido Sanusi (middle) presenting prize to one of the polo players at the charity tournament in London, while the GMD of Access Bank Herbert Wigwe (2nd right) and others look on. To an average Nigerian, the game of Polo may be nothing more than a group of men riding on a horse trying to hit a round object, but for Access Bank, a leading player in the Nigerian banking industry, the game is an avenue to further deepen its commitment towards impacting the environment and positively affecting the lives of its teeming customers. With the successful finale of its yearly UNICEF Charity Shield Polo Tournament in partnership with Fifth Chukker held at the prestigious Guards Polo Club, Windsor, United Kingdom, Access bank has further demonstrated its commitment to making a difference through charity. The event saw hundreds of game lovers throng the pitch to watch the Nigerian duo, Adamu Atta and Babangida Usman play alongside the number one Polo player in the World, Argentine, Adolfo Cambiasso. The Emir of Kano, HRH Sanusi Lamido Sanusi; businesswoman and philanthropist, Bola Shagaya; CEO of Oando Plc., Wale Tinubu; and entrepreneurs, Kola and Tunde Karim were some of the distinguished guests present to support Access Bank’s cause by purchasing artworks worth $30,000 (N11 million) from notable masters of the arts; Ben Enwonwu, Muraina Oyelami, Ablade Glover and Bruce Onabrokpeya. Another $2.2million (N800 million) was raised in pledges to renovate dilapidated classrooms and provide a better learning environment for underprivileged and displaced children in Kaduna over the next five years. The first edition organized in partnership with UNICEF and Fifth Chukker saw Access Bank raising funds to support services for 240 orphans and at-risk children in six local government areas in Kaduna, with a specific focus on 12 communities. With the event growing in influence and popularity, it has established itself as a destination for some of the best polo players in the world, fans of the game, and leading philanthropists. The tournament continues to expand for impact with the 2017 edition successfully raising funds to support full and partial scholarships for 12,500 children. It also allows for the provision of community-based projects like boreholes, sanitary toilet facilities and improved classrooms for institutions in the government-run school network – all-important indices of the drive to improve rates of enrolment in schools for at-risk children. “This year we have grown our balance sheet by 26 percent and increased year on year profits by 76 percent. Our achievements owe much to the strong partnership we have with our parent Bank. Our joint support of this new decade of the Access Bank Group/UNICEF Charity Shield with Fifth Chukker is an evidence of the social and economic value of that partnership,” he added. In his remark, Herbert Wigwe, Group Managing Director of Access Bank Plc, confirmed that the Bank’s continued support for the Fifth Chukker UNICEF initiative is predicated on its role as a change agent in Nigeria and Africa, which can help institute socio-economic development through responsible business practice, social initiatives, and environmental consideration.“We will continue to look for ways through which more resources can be pooled towards supporting the children. We are part of the community and as such we support its wellbeing,” he stated.